That’s a lot of communication. While we send a lot of emails, many of them are not effective. Everyone’s inbox holds those difficult to read or process emails, hanging around because the recipient is unclear on how to reply or act. Don’t let that happen to your business emails. Etiquette, style, and format are essential to writing emails that get results. This article will highlight best practices and walk you through an effective business email, step-by-step. By integrating these methods into your email preparation, you will write better emails and improve overall communication. In all business writing, the audience is the top consideration. Who you are writing for will determine how you write your email. The reader will determine the tone, formality, and content of the communication. Your email’s reader may be your colleague, client, or supervisor. Each reader will have a different background, project knowledge, and priorities. You can use project acronyms with a colleague who has the same deep project knowledge as you do. Those same acronyms will be confusing to an executive who needs an update for budget forecasting. With your audience at the forefront, you will always write a more effective email. The audience includes all the people included in the sender fields. This includes the To:, CC:. and BCC: fields but main focus should be on those in the To field. Writing for the audience also means using these fields correctly. The ‘To:’ field is for the direct audience who needs to reply or take action from the email content. The ‘CC:’ field is for readers who need to receive the email conversation for reference or clarity, but do not need to take action nor reply. The ‘BCC:’ field is for the audience who only needs to see the initial email and none of the later chain of replies. Incorrect usage of the sender fields is a common business email mistake. It occurs when the audience and their roles are not thoughtfully considered. Use the Bcc field very judiciously. Often it's best to forward an email separately, with a brief statement on why you're sending this information. An email must have a purpose. And it must have only one purpose. This email practice is called the ‘one thing rule’. Each email should cover only one specific item, task, or request. Covering multiple actions in one email can cause confusion and inefficiency. One email should not include both client report revision notes and a scheduling question for the quarterly meeting. This scenario calls for two separate emails. By limiting emails to one thing, the email is easier for the recipient to understand, process and act upon. This clarity increases understanding and productivity. In practice, we sometimes have to ask for several pieces of information related to the same topic. In this case, use a numbersed list to clarify for your reader that the request has components. This will help your reader respond easily and ensure you receive all the specifics you need. There is a tendency to over-communicate by email. While email is efficient and provides an electronic paper-trail, not all communication should occur over email. Ask yourself: “Is this email really necessary?” Perhaps a quick phone call or a ping on the company messenger is more appropriate. If you’re expecting a lot of back-and-forth on the topic, a short conversation can eliminate a lengthy email chain. Choose the right channel to send information. Email is great, but it's one channel. Email can be used in many scenarios but is not always appropriate. If you are delivering bad news, do so in person or buffer the email thoughtfully. An email is impersonal and is difficult to convey empathy or compassion. If you must write a business apology email follow these rules. Sensitive information sent by email runs the risk of being accidentally shared. There are plenty of cases of email mishaps, ranging from funny to serious. Whether the information is personal contact or personal opinion, consider whether it’s appropriate for an email. If you wouldn’t want it accidentally shared, be very thoughtful about how it is sent in the first place. If you are unsure if an email is appropriate, ask yourself if you'd be comfortable with that email being projected in a meeting. Attending the meeting are your boss, all your future bosses, and your mother. If it passes this test, then send it. If not, there is likely something that is not appropriate. Business emails have a very specific style. They are professional but brief. They should be written to be skimmed, but with enough information to allow a complete response. If you like this article you may be interested in our online email writing course. Finding the correct tone can be the biggest headache in drafting an email. The tone changes based on your audience. It can range to formal to friendly but is always professional and should always be matched to your audience. Wordy politeness can often be overlooked in efforts to be brief in emails. However, please and thank you should be included anytime it is appropriate. Avoid ALL CAPS because it SOUNDS LIKE YOU’RE YELLING (and could route your email to the spam folder). If you wouldn’t shout the statement in person, don’t shout it in an email. Instead, use italics, underlining or bold to emphasize important points. Example: Vacation requests must be submitted at least two weeks in advance. Notice the harsh tone if the bold text is swapped for caps: Vacation requests must be submitted AT LEAST TWO WEEKS IN ADVANCE. One exception: Do use all caps in email headings when writing to any organization that strips html formatting from email. The military, military academies, and some financial institutions with strict security protocols often strip html formatting. Headings are very helpful to readers. They allow a reader to skim and find information easily. They're a business writer's best weapon against information overload. Avoid excessive use of punctuation or emojis. Exclamation points should be used sparingly! Emojis continue to have a larger role in digital communication and several style guides have approved their judicious use in business writing. I follow the rule of only using them after the other party has sent one. They should never be used in formal business emails. Emails are meant to be skimmed, so they should have plenty of white-space to assist the reader. Use shorter paragraphs, lists and bullet points to streamline the information. And, use headings to break up concepts and allow a reader to skim. In addition, awkward formatting copied from other documents or emails can be distracting. To have seamless formatting for your email, strip the text formatting of the new content by using your email client’s Remove or Formatting function. Here are the most common formatting features and how to use them. Font: The font is the typeface that you should choose for your email. It is best to choose a sans serif (a typeface without decorative strokes at the end) as they are more modern and simple and easy to read onscreen. They are also easier to read at a small size. Gmail uses Sans Serif as the default. You could also use Arial, Helvetica, Tahoma, Terbuchet MS, or Verdana. Text Size: You should try to keep your email in the normal size. This is between 10–12pt. Bold: You can use bold for headings and to emphasise important text. Bold text catches the eye of readers as they scan the email. Italics: Italics are a softer way to draw attention to an area of text. They are used to bring emphasis to an area of a sentence. They do not make words stand out when the user is scanning a page the way bold text does. Italics should also be used for titles of full works. Underline: Underlined text can easily be confused for a link. When writing an email, it's best not to use underlined text to draw attention to an area of an email. It is better to use bold or italics. Text Color: You should avoid using multiple text colors in an email as it draws the eye in to multiple locations and looks unprofessional. It is likely that your email program makes your hyperlinks blue. Alignment: Business writing uses text that is fully aligned left. Academic writing indents the first sentence of a paragraph five spaces. In business email, you will never need to indent the start of a paragraph. Users scan pages in a F-shapped pattern. By changing the alignment it makes it more difficult for the reader to skim. Numbers: Using a numbered list can help organize content where the sequence is important. For example if you were describing steps you would want to use a numbered list. Bullet Points: Bullet points are a great way to create white space on your page and draw attention to related items. Bullet points work best for unordered lists. Indent More: In business emails you should not indent the first sentence of a new paragraph. A line break represents the start of a new paragraph. The indent more button allows you to add an indent to text. This is useful on rare occasions when you want to indicate that some information is a subset of what preceeded it. It creates a visual indication that the indented information is less important. Quote Text: If you are referring to quoted text you should use the quote text function. It provides a slight indent to your content and a grey vertical line to the left. This shows readers that you are quoting text. Remove Formatting: If you are pasting text into your email it is vital you use the remove formatting function. Otherwise you will paste the text styles and it will be obvious to your reader that you copy and pasted that text. To use this function select the text you want to remove formatting. Then click the remove formatting button. 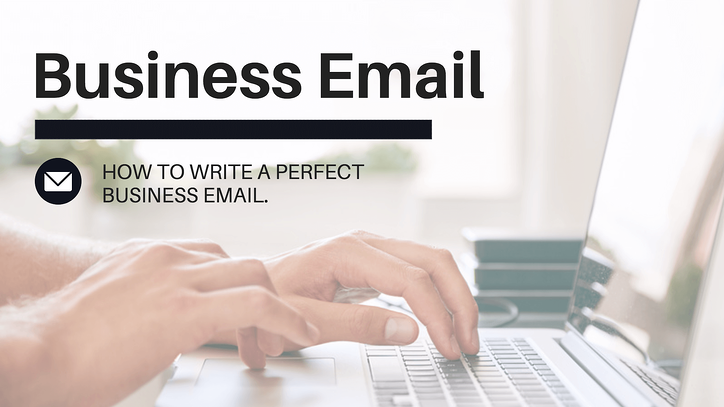 Let's dissect each section of a business email to highlight best practices for you to implement in your writing. The subject line is the mini-summary of your email. It provides the biggest opportunity to ensure your email gets read. The goal of a subject line is to get your reader to open the email without tricking them. It is also the place where mistakes are most commonly made. Think of it as your email’s headline. It should be a 3- to 8-word overview of the content. Subject lines that are too brief or too lengthy cause confusion. If it makes the email seem difficult or confusing to reply to, the recipient may not open it immediately or at all. Email clients will also review the subject line for signs of spam. This is especially important for sales teams who may be cold-emailing clients. Certain terms are flags for spam algorithms and may be filtered to a Junk folder. Avoid using words such as ‘Sales’, ‘Please read’ or ‘Profits’, or having one-word subjects. Your greeting should be professional and concise. It is always preferable to address the recipient using their name, but it may not always be possible. If you’re emailing someone for the first time, your opening line could be a short pleasantry connecting you and the recipient. One sentence should be enough. Indicate how you connected. This reminder will give the reader context for the following information. If you’ve received something from the recipient, offer your thanks. It could be a thank you for an offer of assistance, for an interesting piece of content they shared or even for simply reading the email. If you want to keep it general, warm well-wishes will do. Omit a pleasant greeting if you’ve recently or frequently communicated with each other. Be very careful of overspinning pleasantries at the start of the email. The purpose of your email should be the overt start. Remember the acronmy B.L.O.T — bottom line on top. What do you want your reader to know or do? That's the most important opening. As previously noted, each email should address just one thing, one purpose. This task, request or information should be presented clearly and directly after the pleasantry. This is the B.L.O.T— bottom line on top. Be concise and direct. Don’t hide your request or it can easily be overlooked or ignored. ‘Can you participate in the project kick-off meeting next Thursday? Some business emails may require additional information for the reader. It could be clarification on the task, a link to resources or examples, or other helpful information. This information should be included thoughtfully. Only directly relevant content should be added. Near the end of the email, include a specific call to action. The email is being sent to accomplish one task. The call to action should leave no confusion as to your request. Do not assume the reader understands the desired result from prior information. Emails can easily be misinterpreted if there is any grey area. This statement should include the specific action and the timeline. If you are sending the email to multiple people, clarify task responsibility by directly naming the intended person. Clarification of tasks and expectations allows for the recipient to respond more effectively. If you would like a confirmation, you can phrase the call to action as a question. If the call to action is a notification that does not necessarily require a reply, you can structure the call to action as a statement. The closing message simply indicates that the email is complete. While it is not a requirement in modern email writing, a brief, polite phrase will nicely round out your email. The end of the email includes a sign-off of your name. The phrasing should match the formality of the email. Your email signature is a type of electronic business card that is appended to your email. It should include the most important context and contact details for your reader. This is the place to help your reader with relevant contact or contextual information, not brag or insert philosophical quotes. Images and logos can be useful, but be aware of the sizing and how they will appear on mobile devices. Any referenced attachments or links must be included in the email. Either name the file so that it is clearly identified or include the document title in parenthesis immediately after you mention it in the email. Don’t make the reader go hunting for the information they need. If an attachment was sent to the recipient previously, attach it again anyway. This way, they can easily access the information rather than searching through their inbox. Of course, double-check that the file is attached and correct. Forgetting to include an attachment requires an unnecessary (and embarrassing!) reply requesting it, which can delay the work. Links can be directing the reader either to websites or to intranet directories. These hyperlinks can be lengthy and distracting in email text. Instead, integrate the hyperlink into the existing sentence. Good example: You may find this technical writing resource useful in preparing the report. You should also test the link to ensure that it opens the correct site. Once your email is composed, do not click send. Yet. Take a moment to review your email. Check for grammatical or spelling errors (Grammarly has a helpful free tool). Typos suggest carelessness and can even convey incorrect information. Double-check dates, times, names, links, attachments and other specific details. Triple-check that the correct recipients are in the sender fields. Have you ever clicked send and then gasped in horror? Perhaps it’s an ‘I didn’t mean to send it to that Brad!’ situation. Or it may be the less embarrassing but still annoying ‘I meant to include Brad on that email!’ scenario. Thankfully, some email clients have found a solution to this potential embarrassment with the addition of ‘Undo Send’. 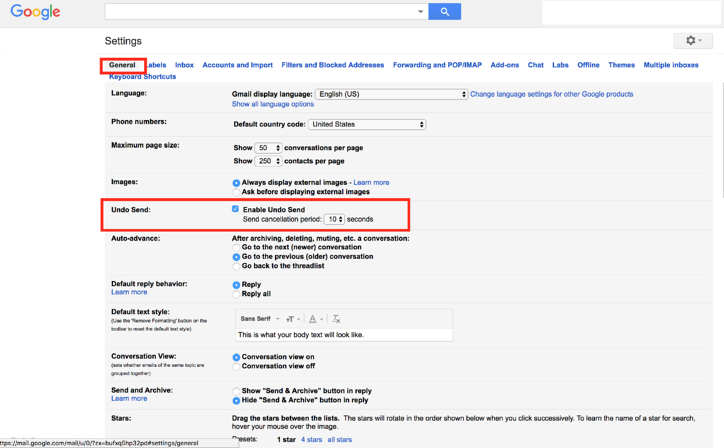 In Gmail, you can enable this function in Settings. You can choose from a 5 to 30 second cancellation period. In OutLook, you can recall an unread email sent to a recipient with an Exchange account in the same organization. This feature does not work will in practice because if it has been read by anyone, it cannot be recalled. In this case, simply forward the email with an error and state your apology and clarification. Do you send the same email over and over again? Save time by using Canned Responses in Gmail. This function allows you to save standard emails. When you would like to send the standard reply, simply select your preferred prepared template in the Compose window. You can also set Canned responses to send automatically to inbound email with specific details. Is your inbox overwhelming? Thoughtful use of filters and folders can help reduce email stress. You can label and even color-code emails from specific people or even whole domains. These labels will allow the emails to be easily archived once read. You can set up filters to automatically mark as read or archive low priority reference emails, like a delivery tracking update. A short investment in setup time will provide long-term time savings. Are you working late, but want your email to arrive in your client’s inbox first thing tomorrow morning? You can schedule emails to send at a specified time in the future using the Boomerang add-on. Caution: If you are sending information to recipients who report to you, don't send late evening emails because it can create an expectation of 24/7 work across your team. Schedule the emails to send at the start of normal work hours. Drafting an effective business email takes time. However, you can save time by using keyboard shortcuts. Save clicks while selecting emails, marking unread, adding a hyperlink and more. Check out the shortcuts for Gmail and Outlook. If you’ve ever sent the email: ‘I’m just checking to see if you got this.’, then you should be using email tracking. There are a wide range of email add-ons and applications that will track if your email is opened by the recipient. The volume of email we receive and send can sometimes diminish our motivation to write an effective business email. Consider the four key questions when preparing an email. Write it in a way that is concise yet clearly conveys the information and request to the reader. Your reader, and their inbox, will appreciate it.